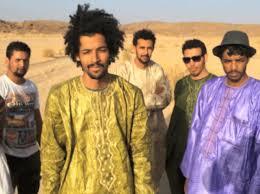 A few years back, on BBC TV’s Later with Jools Holland, I was exposed to the Taureg Nomad desert blues of Bombino, leading to an exploration of the music coming out of the Saharan desert. This is music defined and influenced by the volatile nature of the political and social cultures that both thrive and struggle within the wide open and desolate spaces of this part of North Africa. 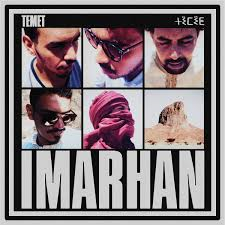 Straight out of this melting pot of innovative and culturally diverse music comes the band Imarhan who released, at the end of February, their second album, Temet. The striking thing about the music coming out of the Sahara, and perhaps defined by the nomadic nature of the people of the Saharan, is how so many influences are welded together to create albums of majestic beauty. With rhythms reflective of the African music played by Nomadic tribes throughout the Northern African countries the blues guitar playing which soars and floats across compliments each other wonderfully. As when the Beatles and The Stones found Indian mysticism and created music using sitars, for instance, the music of Imarhan is what I’d imagine Jimi Hendrix or Jeff Beck would create had they found themselves in Algeria in a search for their psychedelic and spiritual self. The music has been created by people unafraid to explore and live in wide open spaces, a feeling that inspires and defines this album of evocative songs. 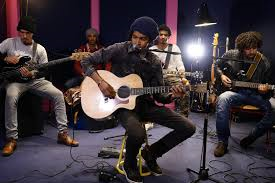 As I often find when listening to albums sung in a language that I don’t understand, the vocals become more of an additional instrument as opposed to sung lyrics, something that Imarhan achieve with a level of accomplishment; the interweaving of voices and guitars is spectacular in its ability to create a sound that not only fills the space the album is played in, but, one imagines, the larger environment in which the music was inspired. That’s not to say, though, that the lyrics do not tell a story or have a power; far from it as there is a passion, an anger, an emotional pull that evokes struggles and desires that are the heart of the message this album wishes to give to the listener. In common with many nomadic peoples, the folklore of story telling, passing on history to future generations is one of the most important ways in which culture is protected. Temet is an album that is important in developing that tradition whilst also sending out a message to both their own people and the wider world about learning from the past to try and ensure the mistakes of the past are both learnt from and not repeated. Temet is a rewarding listen with beautiful melodies, evocative story telling and amazing playing.